We have received some money into our bank account by Direct Deposit without enough information to identify the payer. Please give your name as a reference if you direct deposit. At this time we can't identify someone who deposited from E.C.U. and someone noted as MER. Please contact Carmel if you can identify these. Each of the property owners have written about their place, in the articles below. They are all different and well worth a visit. The field days will consist of up to 2 hours guided looking around, followed by a TREAT afternoon tea. The day at Millaa Millaa starts at 1:30pm as it is further away for most people. Our three acre property on Mazlin Creek near Atherton, was once a part of the Tolga Scrub rainforest, which extended south and along the creek. The property forms a part of the country of the Yidindji people - the traditional owners of this part of the southern Tablelands. Among other things, Aboriginal artefacts found in the area serve as a reminder of this ownership and connection to the country, and as a material example of Indigenous use of this place until as late as the 1940s and 50s. The area was settled by Chinese farmers who introduced corn and other crops until it was subdivided in the 1970s. In 1988 we purchased the property as a lawn with garden beds, a small orchard and shed. With access to TREAT seedlings from the Lake Eacham nursery, extension of the riparian zone with planting and maintenance has continued over the years, and approximately 150 plant species (mostly endemic) are recorded. The property is undergoing yet another transformation - to that of a dynamic landscape where, with each year, rainforest animal species are returning via the riparian corridor to take advantage of host plants and rejuvenated soil. The property is registered with Greening Australia as a Land For Wildlife property. During the early to mid 1900s Chinese market gardeners practised organic farming in this area and this practice has continued in the development of small scale biodynamic agriculture. Biodynamic farming is based on Rudolf Steiner's philosophy, including growing food of high nutritional value while looking after the soil in sequence with the cosmos. In addition to the established mixed orchard, a small area was dedicated to growing biodynamic vegies and herbs. By June 2006 an initial cover crop of field peas was established to make the nitrogen in the soil available to plants. The peas were mixed with oats and barley to make carbon available. Later that year, an educational field day was organised. Talks and theory accompanied demonstrations in the making of a biodynamic compost heap, cow pat pit, and seaweed and other fermented fertilizers and soil conditioners. Without the advice and assistance from TREAT, this project would not have progressed as it has. Thanks for all the expert advice, making trees available for planting on our small family property, and the organisation and plantings for the wider community over the years. The development of this small property serves as an example of what can be achieved when communities work together, for an ecologically sustainable future. In 1987, after 24 years service in the regular army, I decided to leave the Defence Force and together with my wife Gael and our 14 year old daughter looked to buy a small rural-residential property and go into semi-retirement on the Atherton Tablelands. However, due to economic circumstances and the cost of small acreages at the time, we ended up with a 160 acres of "rubbish country", to quote local parlance, just off the Palmerston Highway, 12 kilometres south of the township of Millaa Millaa. The property had been substantially logged out in the early years of settlement and was initially used as a dairy farm, then later as a dry cow paddock. Over the years the property gradually re-vegetated itself despite the land management practices which included the burning of the regrowth and weeds in an effort to maintain some grassland for cattle. In the 1970s the property again changed hands and became a writer's retreat. It was during this time that the first organised tree plantings were carried out in a small area near the entrance to the property. The plantings consisted mainly of hoop pines and tallowwoods. The rest of the property was left unattended and the regrowth persisted in the gullies while paddocks became overgrown with lantana, bramble and guava, with some areas growing nothing but bladygrass, others bracken fern and large patches of wait-a-while. There is very little flat ground and it amazed us that the place was ever considered or cleared for farming as it is mostly hill slopes and gullies. When we moved onto the property the first priority was to find a reasonably flat area to build a shed and house, water tanks, and decide on the power source, solar or mains power. When we found the spot, a bulldozer was called in to push the lantana into heaps, and cement water tanks were built on site, followed by a shed and eventually the house. It was during this time of industry that our daughter decided she would like to keep a few cows, so again the dozer was called in to open up a few of the overgrown paddocks. As many of the slopes were between 20 and 30 degrees we attempted to keep the cows off the steeper slopes by fencing them off, and then during the wet seasons re-vegetated these areas. In the early 1990s there was a Government run tree planting program and we were able to obtain 500 trees which was a great help. We realised that many of the tree species missing from our block were the trees with large seed such as watergum and blackbean. These seeds we collected from neighbouring farms and direct seeded using the bandicoot hole method, find a hole and put a seed in it. We dragged many bags of seeds into the scrub and direct planted this way, an easy method but it has taken years to see results. It was then we heard about TREAT, and between the trees supplied by them and the seedlings we raised ourselves we were able to re-vegetate a much larger area more quickly. Over the years we have also planted an exotic fruit orchard containing such species as abiu, jakfruit, passionfruit, custard apples and carambola, plus a small citrus orchard, all with mixed results. Some years we feel we feed more of the wildlife than ourselves but there is enough to share. Cyclone Larry set us back several years when the forest was brought down, much of it on fences which then needed to be repaired or replaced. One such fence was removed, and as there was a bulldozer handy, we employed the driver to put a road in for us across the paddocks, making access to them easier. This fence was restored several metres down the slope from the new road, and the area between the fence and road was planted with trees supplied by TREAT, many of them food trees for the cassowaries and other wildlife. Since we have been here, we have seen the cassowary population slowly grow. We are now concerned that as tourism expands in the Mungalli area, the cassowary population may be at risk from an increased traffic flow. Our future plans are to reopen some of the original logging tracks and form a ring road around the property, which would make access easier for us and safer movement for the cassowaries. We found that as we made walking tracks, the cassowaries followed them, and brought with them seeds which they deposited along the tracks. As each track is opened, we plant forest food trees beside them in the hope of keeping the cassowaries away from the main road. Galaji, (Ngadjon word for tree fern) is a 100 acre property on Topaz Road. Its European history began in the 19th century when gold miners entered the district. This was when an amazing water race ending at Lady Olive gold mine, was constructed. A tunnel taking water from the Johnstone River catchment to the Russell River catchment is still in excellent condition and can be seen on the property. It is an example of the incredible industry and perseverance of those early miners. Parts of Galaji were cleared for farming after World War 2 and the slopes were grassed. Later the lower slopes were cultivated for the growing of ginger. About 40 years ago the last large scale clearing was carried out west of the creek but the slopes were never grassed. Forest has regrown here and forms a corridor between Topaz Road National Park and Topaz Nature Refuge (which connects with Wooroonooran National Park), and this area now constitutes Galaji Nature Refuge. John and I purchased the property in 2003, by which time all previously cultivated parts, all upper slopes and remaining rainforest edges were well covered with guinea grass and lantana. We could only work on the property on weekends and holidays, so the first few years were spent clearing and "finding" the property's various features. As some control was gained, plans could be made for revegetation and with that in mind, seeds were collected locally and nurseries set up. In 2009 a Nature Assist grant provided 2,600 trees and this year, TREAT has provided 300 more trees. About 1,000 home grown plants have also been planted. TREAT has also provided 180 trees for an experimental plot where long stem planting will be studied. Revegetation on this property has been a big learning experience as we try to balance factors such as costs, manpower, time, rain, weeds, Larry, bandicoots, wallabies, feral pigs etc. A big future project will be dealing with some acres of running bamboo! We will be keen to listen to comments and views of visitors, with their own experiences and knowledge of revegetation in this district. In 1994, we started the Forest Restoration Research Unit in northern Thailand's Chiang Mai University (FORRU-CMU), to study how to restore the region's seasonally dry tropical forest ecosystems. At the time, the idea of restoring forests, where people had been struggling for generations to clear them to grow food, was viewed as rather naïve, if not actually foolish, and potential funders were not impressed. But all that changed in the early 1990s when a major initiative was launched to restore 8,000 sq km of forests, all over Thailand, to celebrate the golden jubilee of King Bhumibol Adulyadej. Suddenly, everyone wanted to plant native forest trees, but no one knew which species were suitable and how to grow them, and our proposal for a forest restoration research unit was funded (by Richemonde Bangkok Ltd). We built a small research nursery in Doi Suthep-Pui National Park, near to the university campus, and began our research program. We started by simply observing the flowering and fruiting patterns of the tree species along trails, which wound through the natural evergreen forest, close to the nursery. Seeds were collected and simple experiments set up to maximize seed germination and seedling growth, in order to prepare a mixed species crop of native forest trees, ready for field experiments. We planted the trees out in a deforested site and then recorded, in meticulous detail, exactly how fast each species died over the subsequent two years or so. Clearly we needed a rethink. Then, in 1996, I was lucky enough to meet Nigel Tucker at a conference in Washington DC. After I had just presented the initial results from our project, Nigel came up to me and handed me a copy of "Repairing the Rainforest" (which he co-authored with Steve Goosem) and explained how they had started in the same way at Lake Eacham, 15 years previously, but had subsequently developed the highly effective framework species method to restore Queenland's Wet Tropics World Heritage Site. Both Nigel's enthusiasm and the book were inspiring and we soon realized that sending our staff to Lake Eacham for training could knock years off our research program in Thailand. So about a year later, with the generosity of the International Tropical Timber Organisation, two of us spent 2 weeks at Lake Eacham. We learnt about the framework species concept in detail, marveled at the rapid results, picked up dozens of technical tips to improve tree production and, of course, joined with TREAT volunteers for the Friday morning nursery work sessions. 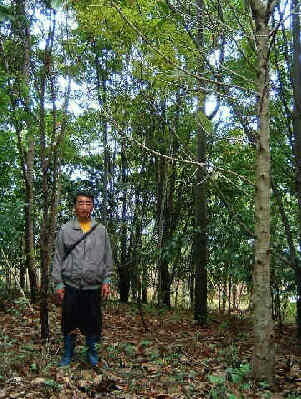 FORRU-CMU's six-year old framework species test plot in Doi Suthep-Pui National Park, N. Thailand, 2004. On our return to Thailand, we trawled through our data files, looking for Thai forest tree species, which might qualify as suitable framework species. We improved our nursery techniques for producing healthy planting stock. We set up field trials to test our "candidate" framework tree species and we looked at how the example of outreach to the community, which we had learned from TREAT, could be transferred to the socio-economic conditions of Thailand. The plots we subsequently planted in 1998 turned out to be the first that showed real promise. Today, when I walk through those plots, I am struck by how similar they look and feel to plots of the same age, which we visited during our first trip to Queensland in 1997 - a lofty, dense, multilayered canopy has replaced the weeds with a deep layer of leaf litter, in which seedlings of dozens of incoming tree species have taken root. The tree species are, of course, very different to Australian ones, but I think we can say, with some pride, that we have successfully transplanted Goosem and Tucker's framework concept to the hillsides of northern Thailand, where it is now thriving. Each year, the plot system was expanded and the data came flooding in. Students from CMU's Biology Department were soon working on biodiversity recovery in the plots for their thesis projects. Birds increased from 30 species to more than 80. Seeds brought in, mainly by those birds, resulted in more than 70 recruit tree species colonizing the plots. Even fungi and lichens species increased. Soon, news of the success of the project spread and the demand for training workshops and other educational events grew faster than our research team could cope. So we set up an education/outreach sub-unit and produced a practical manual, based on our research results, called "How to Plant a Forest". 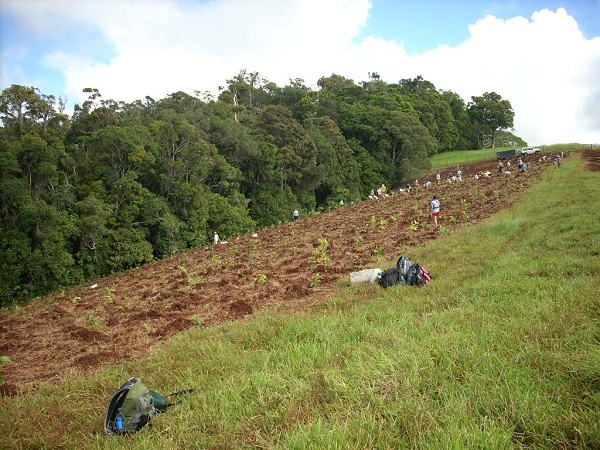 We started a schools program and ran workshops for NGO's and other community groups, helping to increase the biodiversity potential of dozens of tree planting projects all over the country. 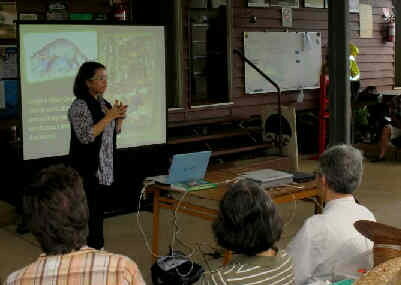 FORRU-CMU field officer, Kwankhao Sinhaseni presents FORRU-CMU's work at the Friday-morning work session at Lake Eacham nursery, 12 February 2010. With support from Britain's Darwin Initiative, we wrote a research manual for scientists and translated our books into six southeast Asian languages. So now, armed with these text books, in the local languages, we are working with forest agencies to create forest restoration research units in China, Cambodia and Indonesia. So the framework species approach is now being applied to restore the soaring Rhododendron forests of Yunnan's Gaoligongshan Mountains, the drier seasonal forests around the famous Angkor Wat World Heritage Site and the equatorial rainforest of Sumatra, thanks, at least in part, to the ideas, skills, and above all enthusiasm, which we picked up at Lake Eacham in 1997. Last month, three of the FORRU-CMU team made a return visit to Queensland, this time with support from Britain's Darwin Initiative and the generosity of Nigel Tucker's new company, Biotropica. What impressed us most was the noticeable increase in the number of trees, at the landscape level, since 1997 - many of them planted by TREAT. The single forest corridor (Donaghy's), where we planted a few trees during the first visit, has grown into a network that snakes across the landscape in all directions. The nursery at Lake Eacham is bursting at the seams with healthy trees and TREAT has not only survived, but flourished, with even more volunteers at the Friday-morning nursery work session than we saw in 1997. In the newly constructed exhibition room at Lake Eacham, we read TREAT's slogan "the right tree, in the right place, for the right reason, at the right time". Perhaps another slogan to consider . . ."the right information, to the right people, at the right time" . . . this too can result in a lot of trees being planted and not just in Queensland. We thank Nigel Tucker, the staff at Lake Eacham and Biotropica, TREAT members and everyone else we met during our recent visit, for making us feel so welcome. "How to Plant a Forest" and FORRU-CMU's other publications can be viewed for free at Forest Restoration Research Unit - Thailand www.forru.org. There were six community plantings this wet season. They were held on successive weekends from the end of January till the beginning of March, and the weather was kind, insofar as the ground was wet for planting, but no planting was done in pouring rain. Altogether, approximately 11,500 trees were planted. Volunteer numbers ranged from 41 to 74. The School for Field Studies students swelled the numbers at both of the Peterson Creek plantings and at the Emms' planting. TREAT had organised round bales of hay to be spread at the Peterson Creek plantings and the students happily attacked this task as well as the planting. At the Emms' planting, more and more trees were brought up to the site for planting, the total number being over 3000 instead of the 2000 intended, and the site was fully planted in the expected planting time. The Emms' planting was mulched later by volunteers from Conservation Volunteers Australia. At the McCaffrey's planting, Mark had small bales of hay which were easier for the volunteers to carry across the sloping site. TREAT held our usual (very welcome) barbeque after the first five plantings, and a morning tea after the last planting, which was only 1000 trees. At three of the plantings we had the benefit of shed facilities for the barbeque, but at the other plantings, TREAT's marquees were erected. Only at the Seisa's planting in January did the marquee get wet. None of the plantings were funded through Caring For Our Country grant programs. The Seisa's planting was funded by an Envirofund grant, the Gallo's planting by Reef Rescue funding, and the McCaffrey's planting by the Vegetation Incentives program. Carolyn and Philip Emms funded their own planting and the two Peterson Creek plantings were funded by TREAT and QPWS. Maintenance of the Peterson Creek plantings will be partly funded through Terrain NRM from the Australian Government's Regional Investment Strategy. Everyone seems to enjoy the community plantings and many volunteers wanted to have more plantings. Hopefully some of our applications for this year's Caring For Our Country grants will be successful, and more plantings can be scheduled for next wet season. In Science this term, we have been learning about the interdependence of plants and animals and each child has done a research project on an animal native to the Atherton Tablelands. Last week we had a wonderful excursion to the Tolga Bat Hospital to help consolidate our understanding of the important role that bats play in maintaining a healthy natural environment. This week we were fortunate to be able to visit the TREAT Nursery to learn more about plants. When we arrived at the nursery we were greeted by Barbara and then met Rosemarie, Dawn and Jim. We loved the beautiful stained glass window at the top of the ramp and identified on it many of the animals we had researched. Then we broke into two groups to have a look around. Each group spent some time in the Display Centre learning about the ways that the forest grows. We learnt about the importance of pioneer trees and the need for forest corridors to be planted so that animals can move safely from one area to another. The pictures and information on the walls were great. Then we visited the nursery area. On the way up the stairs we saw a beautiful, big Golden Orb spider on the web she had woven. We were shown around all the different sections of the nursery. One area was where smaller plants were kept under cover. We also saw LOTS and LOTS of bigger plants outside. Then both groups came together and were divided again, this time into three groups. One group was shown how to clean seed; the second group was shown how to pot-up and care for seedlings; and the third group put together a giant wooden plant and animal jigsaw. There were also interesting reference books and charts for the children to look at. After the children had finished rotating through all the activities, they were given a talk about the ways trees help animals survive and thrive in the environment. We finished off with a colouring activity and were given some resources to take back to school. All activities required each group to work together as a team and the children proved themselves to be great ambassadors for our school with their positive attitude and good-manners. We are very grateful for the time we had at the nursery and for everything we learnt. A big THANK YOU from us! Then we went to the picnic area at the Lake for lunch. We followed the rules and didn't feed the brush turkeys who came to visit us. It was fun watching them though. Then we went for a short walk along the edge of the Lake before boarding the bus for a happy and contented ride back to school. Thank you again to Barbara, Dawn, Rosemarie and Jim for a great excursion, and to all the TREAT volunteers who make this wonderful nursery possible. As the first month of our spring semester passes in the Australian rainforest there is a significant amount to reflect upon. I try and think of my fondest moments here, and I realize it may be something different from what I would have originally expected. Getting up at six o'clock on a Saturday morning to plant trees, despite the weather conditions, has become one of my most favourite activities here in the rainforest. The sense of accomplishment and recognizing the strong commmunity structure is worth the lack of sleep on a Saturday morning. As students studying about all the environmental issues up here on the Atherton Tablelands, it is important for us to feel like we are making a difference during our short stay here. Meeting the local people that are passionate about the well being of their home is admirable. Getting wet, dirty, and maybe a little sunburn along the way only improves character and makes us feel worthwhile. After each tree planting morning, someone always thanks the School for Field Studies for their help. They claim that the work would take twice as long without the school's attendance. When over two thousand trees are planted before eleven o'clock in the morning, the way one looks at Saturdays will be forever changed. I have been studying the Tooth-billed Bowerbirds near my house since 1989. Long-term studies often turn up unexpected stuff. One of the fascinations of Bowerbirds is that they have complicated cultures - very much like we humans in some respects. The Tooth-billed Bowerbirds near my house return every spring to a particular section of the ridgetop and set up their "courts". Courts are for courting (and indeed for consummating the relationship between the male, who owns the court, and any female, who selects him as the father for her chicks). The collection of courts is called a "lek". A lek is a gathering of males of any animal species where the males each defend a small breeding territory, where they can see or hear one another and they compete for the attention of females, who pick and choose amongst the rivals. TREAT readers will already be familiar with the courts of the Tooth-bills. The males clear a couple of square metres of forest floor and lay leaves, pale side up, on the dark earth. Presumably this eye-catching display attracts females. Probably more important, however, is the loud song they deliver from a perch just above the court. This song is rich in mimicry and they spend about 60% of each day for four months presenting it. The rest of the day is spent either feeding or pinching leaves from neighbouring courts. Stealing leaves must be an exercise in dominance because the availability of suitable leaves is unlimited. I tallied up the number of leaves each male stole from other courts and it was clear some were being robbed blind whilst others rarely allowed a leaf to be stolen. The thing about Tooth-bill leaves is that all the birds in a lek use the same species of leaves. However, the species used vary from one part of the Tablelands to another. They have a local "leaf culture" just as human cultures vary in behaviour and clothing. Another characteristic of Tooth-bills is that each Spring they establish their courts in exactly the same place each year. Even if the owner of the court does not survive the winter another male is waiting in the wings and will do the honours with the leaves and singing. So another part of the culture appears to be that all the birds in the area know where the courts are supposed to be. Again, there are an infinite number of sites suitable for courts but the males compete for the traditional sites and presumably fail to breed until they establish ownership of a court site. On the ridge at home the lek of ten courts extends for only 700m although the ridge is several km long and appears to be equally suitable along its length. It seems reasonable to suppose that this site has been in use for hundreds, if not thousands, of years with minimal variation. Like humans the Tooth-bill's residential behaviour is at least semi-permanent. However, in nature, nothing is absolutely permanent or unchanging - so having established the ground rules for Tooth-bills I will now relate the twenty year history of "my" lek. I made my first observations in 1989. In 1990 illegal loggers came on to our land and removed 117 prime trees before we caught up with them. In the process they bulldozed six of the ten Tooth-bill courts. No problem! The birds moved a few metres and just carried on. They were a lot more sanguine than I was! The lek carried on without much change until 1995. The leaves used were dominated by Alpinia caerulea, Cryptocarya mackinnoniana and Castanospora alphandii. One court was moved a few metres and one court was temporarily abandoned. In 1995 a new court appeared, unusually close to three others. The surprising thing was that this bird was using Pullea stutzeri leaves and a few other species, which I had not recorded on courts before. I surmise that this bird had come from a distant culture! Although Pullea is used by Tooth-bills on other parts of the Tablelands I have yet to find an area where this species is dominant and used in combination with Lethedon setosa and Rapanea achradifolia. If any readers know of such a Tooth-bill culture I would love to hear of it. This bird survived for five years and then disappeared. However, his influence is still apparent ten years later and some of my birds now use Pullea leaves in their display. Cultures can change! Another strange thing happened in 2000. Four new courts appeared at the upper end of the lek and three of these used Pullea leaves. These courts only lasted one year. I am at a loss to explain what caused this. Then came Cyclone Larry in March 2006. The following Spring saw only two courts established and one of those was on top of a log! Clearly something drastic had happened to the birds. In 2005 I knew that I had at least twelve banded male Tooth-bills. In 2007 only one of these birds was still present and only four courts were established instead of the usual ten. What had happened to the missing birds? The homing instinct of these birds is presumably very strong. Either they had dispersed so far after the Cyclone that they could not find their way back (unlikely) or they had died. If the latter, were they injured or did they starve? There was very little fruit in the forest after the cyclone. Whatever the answer it is clear that this community of Tooth-billed Bowerbirds has been severely depleted. There are not even enough birds to re-establish the original ten courts. Indeed it seems as though so few birds survived that some of the original court sites are no longer in the community memory. Last year, four years after the Cyclone, I had six operating courts but one was not in a traditional position and two were not operated for the full season. It will be interesting to see how this lek fares in the future. Will it grow back to ten courts? Will the courts be in the traditional positions? extreme events such as cyclones and droughts shape our ecosystems (not "average" conditions) and those organisms that survive long term must be sufficiently versatile to cope. What a busy three months it's been since the last newsletter. As usual for the planting season, the nursery staff have been chasing their tails to get as much as possible done before the wet weather disappears. The nursery has been in great shape, being at full capacity in January, with plenty of mature stock going out to plantings. In February TREAT and QPWS nursery staff held two community tree planting field days as part of the Peterson Creek Linkage Project, planting approximately 4000 trees over the two plantings. The first planting held on the 6th February saw around 2000 trees planted on the Mete's family property completing that section of the corridor. Conditions were steamy after a week of hot weather leading up to the planting with storms breaking just the day or two before, so it was a great achievement for all who were planting and mulching that morning. The site is doing quite well and is due for a spray as soon as the weather permits. 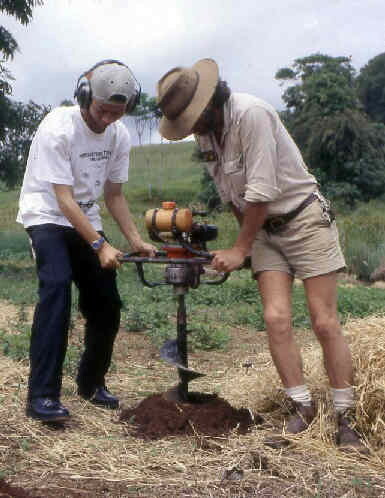 The second planting was held at the Williams' property on 27th February. 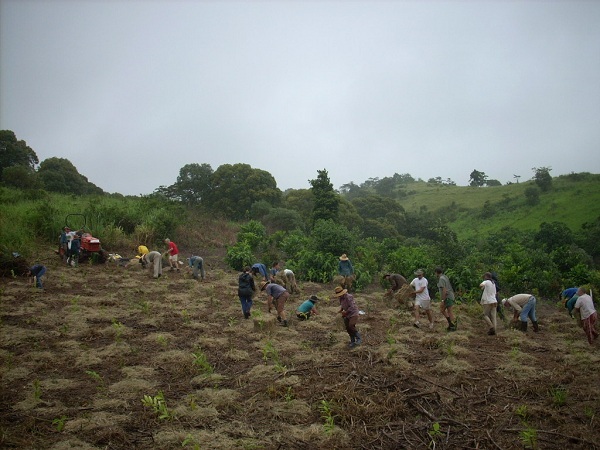 Again, around 2000 trees were planted in rather warm conditions, this time on the creek bank opposite Curtain Fig National Park. The going was rather difficult due to wet conditions leading up to the day causing the clay soils on the site to become extremely sticky. On both occasions everyone was extremely grateful for the efforts of the TREAT Catering crew. Two other plantings on Peterson Creek that were scheduled for Friday mornings during February, had to be postponed due to inaccessibility to the site. These plantings, whilst small, will play an important part in helping protect and enhance remnant riparian vegetation and will be rescheduled for later this year after the dry season. Apart from the 4000 trees that were planted as part of this project, a further 10,000 trees have been supplied to TREAT members for projects on their properties. To date, 1500 trees have been supplied to QPWS Ranger in Charge, Les Jackson, for his ongoing revegetation and firebreak plantings at Eubenangee Swamp National Park. Thirty trees were also supplied to Tableland National Parks Volunteers for remnant enhancement work at Halloran's Hill Conservation Park. QPWS projects still ahead for this year include on park plantings at Mission Beach, Tully, Mossman, Mowbray and possibly Goldsborough Valley. On 15th February the nursery had its annual inspection under the Nursery Industry Accreditation Scheme Australia (NIASA) accreditation program. Nursery and Garden Industry Queensland, Farm Management Systems Officer, Ryan Taylor, found the nursery to be in good order and provided, as usual, much useful information to assist with growing healthy, weed and pathogen free, seedling stock for our projects. A most useful range of products are now available to the nursery industry in the form of instant tests to confirm the presence of harmful soil pathogens such as Phytophthora spp., Pythium spp, Rhyzoctonia spp. and others, allowing these types of infestations to be treated more effectively than before. The nursery has retained its accreditation status for 2010, and since 1995, when staff introduced industry best practices to our growing regime. Accreditation ensures we can have confidence that the plants we supply to TREAT members and to projects within the Queensland National Parks Estate are all low-to-no risk when it comes to harmful pests or pathogens. Another 4000 trees were planted this season on TREAT's Peterson Creek project, but approximately 10,000 trees have gone out to members for planting on their own properties. A major proportion of these have been allocated through our tree applications process, where members can apply for up to 300 trees in a season, for planting on approved projects. A project is approved if it meets various requirements, and some projects are ongoing over several years. Each year, however, there are new projects to be viewed. In recent months, two or three of us from TREAT have visited a dozen properties to do that, and give advice when needed. When possible, QPWS staff will come with us, and we're always grateful for their presence as their experience is far greater than ours. The projects cover a range of scenarios: windbreak and screen areas, habitat plantings, creating corridor areas for wildlife, revegetating creek banks, controlling erosion areas, planting on excavated spoil along a gully, replacing poisoned lantana on steep slopes to a creek. I always find it a privilege to visit members' properties and see the work they're doing and the projects they envisage. So many are passionate about their environment and enthusiastic for improvement. Sometimes the members are experienced planters and know a lot more than us, and sometimes they're complete novices as we once were, and then our advice gets down to basics. If we've travelled a fair distance and time permits, a morning or afternoon cup of tea is always a bonus. Applications for trees can still be made, but in general, trees will not be available now till next wet season. Sundacarpus amara Black Pine 7.8.2, 7.8.4.